This small business complex near the city centre offers a sheltered, cosy environment in the leafy courtyard of the main building away from traffic noise. There is 1 small office and 4 medium-sized offices that are ready to use, furnished or unfurnished, with WiFi, shared copier/scanner/fax, coffee machines and an outdoor smoking area. Good parking options, and close to public transport and shopping facilities. Found in the district of Tresnjevka, this business centre is in a highly convenient location, only a 7-minute walk away from the heart of Zagreb. The centre is the ideal place for new start-ups or those operating in the digital industry. Spaces are bright, comfortable and functional. The offices come fully furnished and equipped, with beautiful pieces and stylish design. The centre also boasts conference rooms and meeting rooms which are at your disposal. The main train station and airport are easily reached with excellent transport links right on your doorstep. Providing a strategic base for international and local companies these private offices and co-working spaces are set on the 9th floor of an impressive modern building, offering amazing views over the city. Tenants also have access to the spacious underground parking and business lounge on the ground floor. The regional transport links surrounding the building are exceptional, with Zagreb Glavni Kolodvor station within walking distance and the region's main airport only a short drive away. This strategic location is close to the city centre with a number of local amenities and a pleasant suburban community in its surroundings. The centre comes with onsite parking, high-speed Wi-Fi, peaceful breakout/lounge spaces and many support services to enhance your comfort and efficiency. This space can accommodate businesses of any size, and is stylishly furnished to create a motivating atmosphere. 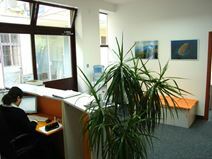 Centrally located in the business district of Zagreb, this brand new building offers first-class offices moderly designed and elegantly furnished. Situated in a renowned area, which hosts international companies, government institutions, shops and amenities, these offices are well connected to the airport and excellently served by public transport. It is the ideal workspace solution for any forward-thinking company.